fennel is a long-standing favourite vegetable of mine, it wasn’t something that i ate when i was growing up – i don’t think we could get it in malawi – and i’m not sure when or why i tried it but now it’s something i instinctively reach for when i’m at the market. 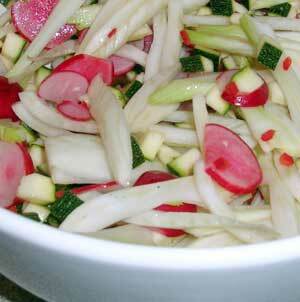 raw fennel in salads is a particular favourite and yet it’s something i often forget about. my default approach involves lemon juice, olive oil and garlic but this simple salad with its zingy asian flavours made a nice change. i served this with salmon that had been roasted with chilli and garlic plus some brown rice. the ultimate vegetarian shepherd’s pie?